People approach them with familiarity. You might think they are a teacher at your kid’s school, someone you knew in college, or the friend of a friend. But more than likely you saw one of them in a movie or while you were binge watching House of Cards. 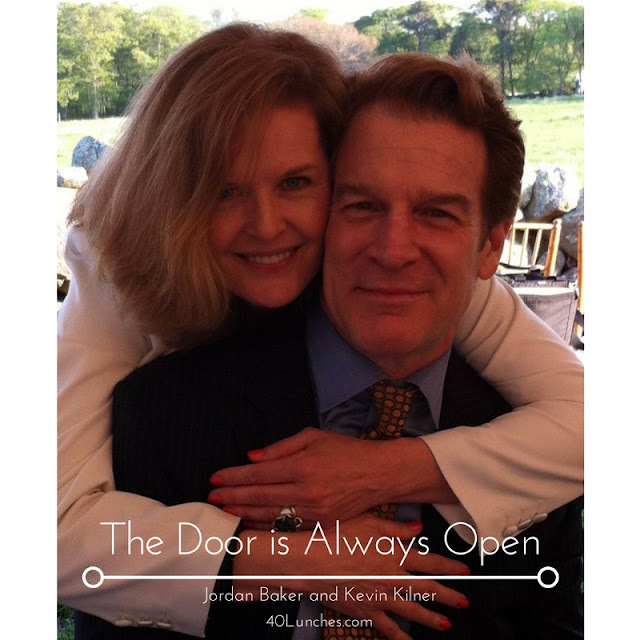 Jordan Baker and Kevin Kilner are actors who have navigated the fickle entertainment industry and maintained careers that have been consistent, and for many, enviable. They are tall and striking, the kind of people who command your attention when they enter the room. We met in New York where was Kevin starring in the Pulitzer-Prize winning play, Dinner With Friends. Jordan and I reconnected that summer when we both attended the Sewanee Writers’Conference. We went for coffee and two hours later had shared our life stories with one another. They have both starred in their own tv shows and performed on Broadway. They belong to a fortunate tribe of actors who have good years and bad, but manage to work consistently due to their talent, perseverance, and the respect of the entertainment community. Anyone who knows them, knows that their door is always open. Their house in LA, a charming fairy tale cottage that was once part of the Barrymore estate, was a revolving door of artists. In the 23 years they have been together, almost half of that time has been spent with someone else living in their home. Even if you weren’t staying with them, they regularly entertained in their enchanting garden, effortlessly throwing together a beautiful table filled with an eclectic mix of people. When I first moved to Los Angeles I was fortunate enough to be invited into their home. Their nephew, who was trying to start a career in film production, was also staying there. We alternated sleeping in the guest bedroom and on the couch. Their generosity extends beyond providing shelter. Jordan and Kevin are connectors, people who are always making introductions and forming alliances. Over the years they have been champions of my work. My first job in LA was the result of an introduction they made three years earlier. They have fed me, encouraged me, counseled, and loved me. But most importantly, they have always had faith in me. Eventually they said goodbye to Los Angeles and their magical garden, and bought a house just outside New York City. I know that even now, the door is always open. They have become a part of my extended family; people who I’m happy play a part in my daughter’s life. They stay busy, so coordinating schedules is always a challenge. In addition to her own career, Jordan started A Room for Thought to provide professional guidance to other actors and artists. Jordan and I found a table at The Cupping Room, a cozy cafe on West Broadway and wait for Kevin, who joins us after taping a voice-over. Although I know they are aware of how appreciative I am for all they’ve done for me, it was nice to have an opportunity to tell them face to face. After all of the meals they have fed me, I was happy to buy them lunch for once. Shortly after I moved to Los Angeles, Jordan and Kevin invited me to a fundraiser. They are strong in their convictions, and put their passions to action by serving organizations that they believe in. Jane Kacsmarek and Bradley Whitford were receiving an award for service. 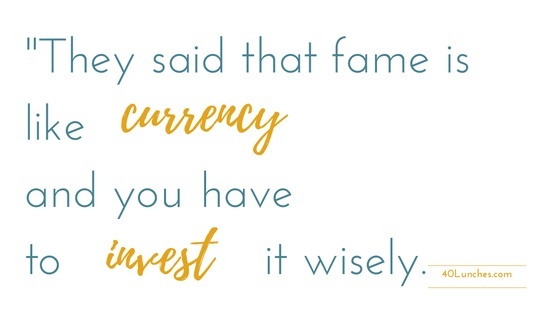 In the speech they gave together they said that fame is like currency and you have to invest it wisely. I don’t know if Jordan and Kevin consider themselves famous; I’ve never asked. But they have used the relationships and resources they have accrued over the years to help others. By their example I have realized we all have currency to invest. It might not come in the form of fame, or even money, but we all have something that we can give to others. Sometimes simply investing our faith in another person becomes a priceless commodity. What a cool story! It's a great reminder of what is really important. Thanks for sharing their story, and I love that quote. Wow...viewing your skills and gifts as currency is a powerful reminder! This story was beautiful! Thanks for being my JesusGlitter and sharing this story about the people who shine bright for others. It is true when we invest in others the rewards are priceless. Very cool story. I love their view on fame.